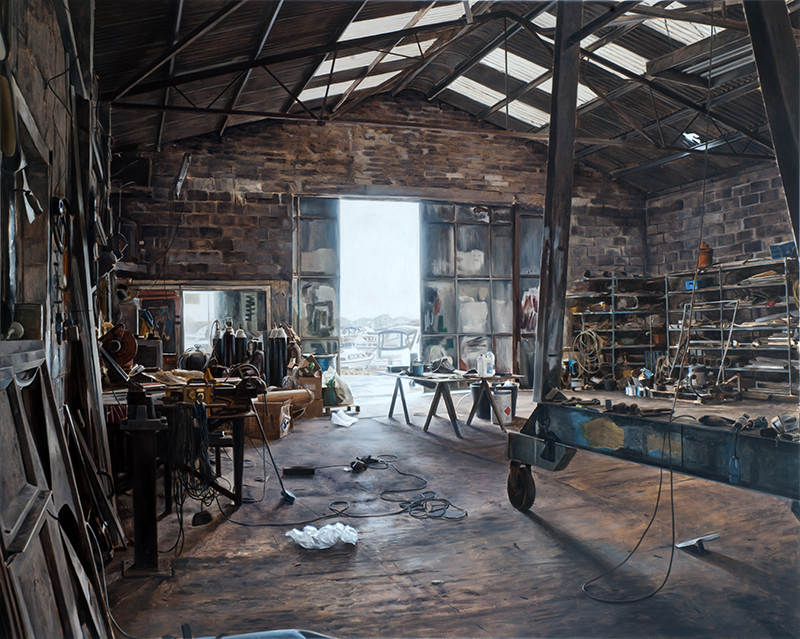 It is the industrial sound of the hit from a hammer’s head (a peen) that provides the title for the latest solo show by painter Kevin Cosgrove, which is currently on show in Kilkenny’s Butler Gallery. Entitled A Peening Sound the exhibition sees Cosgrove present the interior of spaces where said hammer may reside – be they workshops, boatyards, garages or hobbyist sheds. His paintings are sans workers but filled with observations on their occupants’ manual undertakings. The worlds that are subjugated and presented here are meticulously depicted and detailed in oil on linen, with Cosgrove showcasing a larger size than previous exhibitions – some pieces eclipse 1 metre in height and approach 2 metres in length. While the confines of these workshops spaces are central to the work, the presence of the world outside is often seen within the paintings themselves, and present on a spiritual level in all. In Lakeside we see a marina peering through metal doors, framed by the interior of the workshop that it is scattering with illuminating light – these doors serve as exits rather than entrances. They pieces become havens of activity, despite their absence of figures; and while Cosgrove’s imagery depicts isolated moments captured in oil, they speak more about the tangible and lasting rather than the distant and ephemeral. A dichotomy exists within the works on display, an unusual balance proposed by the show’s title – an invisible sound created by the brutish blow and action of a physical hammer. These spaces are hubs of activity that have fallen silent but still bear the marks of interaction and engagement. A Peening Sound showcases an artist exploring the inner worlds he encounters while capturing their drama for future contemplations by both artist and audience alike.